The Virginia State Water Control Board recently received more than 13,000 public comments concerning a “blanket” federal permit that would allow the Atlantic Coast and Mountain Valley pipelines to cross more than 1,000 rivers, streams, and wetlands in Virginia. Conservation groups across Virginia submitted comments describing many proposed water crossings where the permit would likely fail to uphold Virginia water quality standards. The comment period, which closed June 15, was opened after a public meeting in April at which the citizen board raised concerns about the adequacy of the U.S. Army Corps of Engineers’ Nationwide Permit 12 to protect Virginia waterways during pipeline construction. The Mountain Valley and Atlantic Coast pipelines, however, are not the small-scale construction projects for which the permit was intended. These are not small distribution lines, but rather large, high-pressure interstate transmission lines measuring 42 inches (that’s 3 ½ feet!) in diameter. The projects have been approved for a 125-foot construction right-of-way in most areas across the commonwealth. They require the operation of heavy equipment to clear and grade land for a trench to be laid across hundreds of miles of steep and erosion-prone terrain. The Mountain Valley Pipeline and the Atlantic Coast Pipeline are slated to cross over 1,000 water bodies in Virginia alone, and blasting will be required for construction in many of the stream beds. Each crossing has the potential to negatively impact water quality. Horizontal directional drilling under rivers poses the risk of “frac-outs,” where tunneling under a river breaks through to the stream bed and causes drilling fluids to escape into the water. This can pollute drinking water and at a minimum harms aquatic life. Trees cut down near water bodies contribute to erosion and sedimentation, leading to an increase in stormwater runoff, which can also destroy aquatic habitats. Sediment can carry petrochemicals and other pollutants into nearby streams and wetlands, and the sediment itself also harms those habitats. These scenarios are not just hypothetical. The Rover Pipeline, a similar 42-inch diameter interstate gas pipeline, has received numerous citations from the Ohio EPA, including violations for frac-outs. 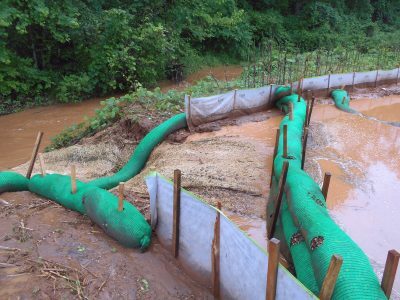 Mountain Valley Pipeline has received multiple Notices of Violation from the West Virginia Department of Environmental Protection for failure to have proper erosion controls at specific construction sites and allowing sediment to flow into water. In Virginia, the State Water Control Board has not yet had the opportunity to vote on permits for actual in-stream construction activities for the Mountain Valley and Atlantic Coast pipelines. Last December, the board approved certifications for the “upland” pipeline construction activities that would have indirect impacts on state waters. While the Virginia Department of Environmental Quality (DEQ) has approved Nationwide Permit 12 for general use in the state, it was the Corps of Engineers that decided this general permit could be applied to these specific pipeline projects. During the recent public comment period, citizens were able share their views on whether Nationwide Permit 12 is appropriate for these huge pipelines. 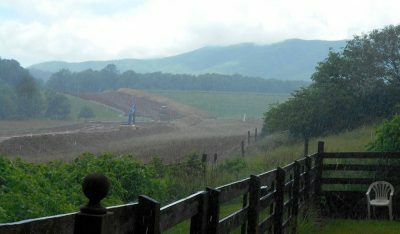 The comment period drew approximately 7,100 comments regarding the Atlantic Coast Pipeline, 2,600 about the Mountain Valley Pipeline, and 3,500 additional comments. The Virginia Environmental Justice Collaborative, of which Appalachian Voices is a member, submitted a comment laying out various concerns, including the disproportionate burden that may be imposed on vulnerable communities if the ACP or MVP cause water quality violations. The Virginia DEQ is currently reviewing the 13,000 comments and compiling a summary for the board. The next meeting of the State Water Control Board is set for August 21, but we and others across the commonwealth are urging them to meet sooner. The board has the ability to suspend or revoke the projects’ certifications, but pipeline construction will continue in the meantime, which is why it’s crucial that they meet sooner than August. Nationwide Permit 12 was not intended for the invasive and large-scale impacts that come with construction of interstate fracked-gas pipelines. The Corps’ general permit does not go far enough in protecting Virginia’s water quality. Instead of relying on the one-size-fits-all permit, the DEQ and the State Water Control Board should perform a more meticulous review of each proposed water crossing to ensure that the Mountain Valley and Atlantic Coast pipelines will not damage the streams that citizens depend on for safe drinking water, fishing and recreation.